Beer Beach is a shingle beach known for being surrounded by stunning limestone cliffs. It is a sheltered cove with waters ideal for swimming. Since the beach is protected from impacts of both strong winds and waves, having been situated in a cove, it is quite ideal for a family getaway. Aside from its natural flair, Beer Beach is further beautified by brightly colored boats signifying the village’s rich fish industry. It has a wide array of sea products which include crabs, scallops, lobsters, fish, and many others. 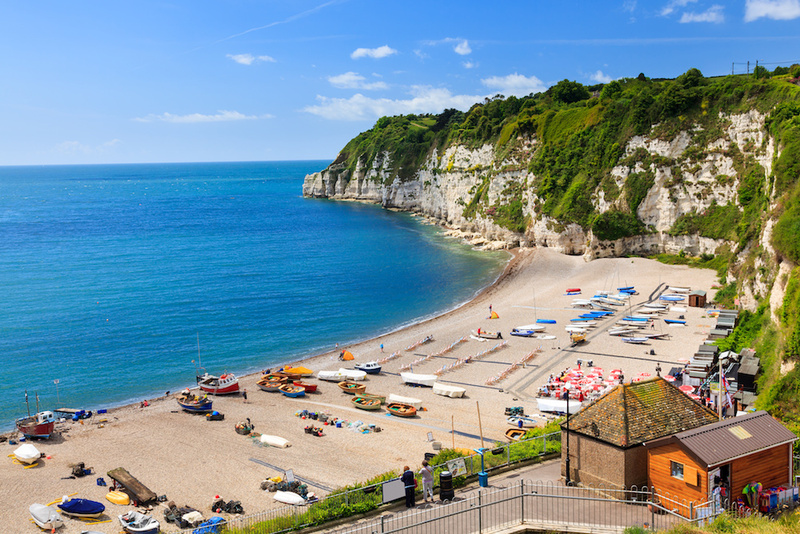 Beer Beach is located in East Devon, a district in Devon, England, particularly in the village of Beer. It forms a part of the famous 95-mile Jurassic Coast World Heritage Site, one of England’s first. Its popular “Beer Head” is part of the well-known South West Coast Path. Since this beach is still being improved upon, its features are considerably less as compared to more commercialized beaches. It does, however, have a lot to show off. For example, there are some fish fleets worth seeing which include crab pots, nets and winches. It adds a little beauty to the place. Beer Beach boasts its small but attractive multi-colored fishing boats parked by the edge of the waters of the beach. This is a two-fold display showing the fish industry’s great contribution in the economy alongside with tourism from colorful parked boats and live featuring of fish, crab and lobster catching by numerous boats. Being a shingle beach, there are no significantly strong currents but there is a high probability of immediate out-of-depth experience when an individual enters the waters. This means the seabed is steep and that you can suddenly descend into deeper waters. Although it may be a source of thrills, it is not recommended for swimmers who are not that confident given that there is no lifeguard present at Beer Beach. Currently, there are limited facilities within Beer Beach. However, it showcases some of the basic amenities for a beach. For example, there is an ample parking area for visitors located within close proximity to the beach. An alternative to this would be the car park near the center of the village. There are also public toilets which are situated near the beach proper for accessibility. For food and drinks, the village nearby has a lot of cafes and pubs which can cater to varying palates of visitors. Seafood is mostly served along Fore Street, relatively near the beach. Other than these, you can enjoy packed food or freshly caught seafood in beach huts which can be rented out. Most of the activities which can be undertaken in Beer Beach are associated with its waters. Visitors can try out fishing and cooking what they caught for a fresh seafood dining experience. For visitors who are not so into this kind of activity, they may opt to watch boats docking and people fishing. You can hire a small motor launch and take a fishing trip around the beach, too. To maximize the view, you may take a trip up the limestone cliffs with recommendable supervision, of course. There are a lot more beaches within the vicinity of Beer Beach. Tourists can also take a trip around these for a different view or experience. There is a long list for these but to name a few there are Seaton (2 miles), Branscombe (3 miles), Weston Mouth (4 miles), Sidmouth (6 miles), Cobb Lyme Regis (7 miles), Jacobs Ladder Sidmouth (7 miles), Church Beach Lyme Regis (7 miles), Charmouth West (9 miles), Ladram Bay (9 miles), Budleigh Salterton (15 miles).